You are at:Home»Electronics And Gadgets»WITH 120Hz ULTRAMOTION DISPLAY RAZER IS POISED TO TRUE BLUE GAMING PHONE!! Razer is the pioneer of the gaming hardware market – from the first gaming mouse to the first true gaming laptop. Most recently, we’ve delivered our first mobile phone for gamers, setting the standard of what the ultimate mobile gaming experience should be—awesome performance, phenomenal speakers, to most importantly, a silky smooth 120hz UltraMotion display. Technically superior in every way, the Razer Phone is also the first device to support both HDR and 5.1 Netflix content. We’ve often led the way for the rest to follow, and it is clear where the efforts of some these companies are, when you see knock-offs of the Razer Naga MMO mouse, Razer Firefly mat and more. I wouldn’t be surprised if we start to see copycat devices coming out this year calling themselves a gaming phone. Competition and having options are great but I’d suggest gamers to never compromise and continue to demand for the best. We’ve worked with the brightest in the industry, as well as with you, to develop a phone with extreme emphasis on a 120Hz screen that improves motion resolution, reduces screen tearing, and input lag. Our gamers know how much of an impact a screen with fast refresh rates makes on a PC setup, and it is no different to those gaming on a phone. We’ve worked with publishers to enable 120Hz gameplay on some of the top mobile games in the market such as Vainglory, Arena of Valor and Final Fantasy XV Pocket Edition. We deserve the best experience for our games, PC, and mobile. 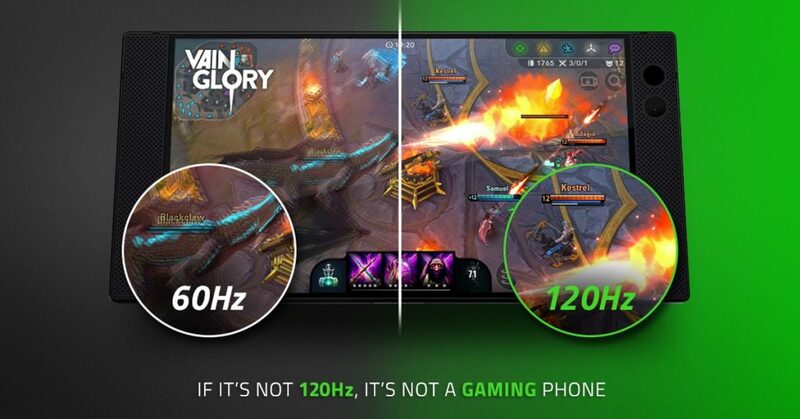 Face it—if it’s not 120Hz, it really shouldn’t be called a gaming phone. Previous ArticleNETIZEN SHARES WHY NOW IS THE RIGHT TIME TO QUIT SMOKING!!! Next Article GUY RENTS CAR THEN GO MIA! CAR MISSING!! REWARD IF CAN FIND CAR!